B.C. Premier John Horgan visited the Jewish Community Centre of Greater Vancouver just before erev Pesach, March 29. The premier had visited the JCCGV before, but only to attend meetings in the boardroom, and this was his first visit as the province’s head of government. 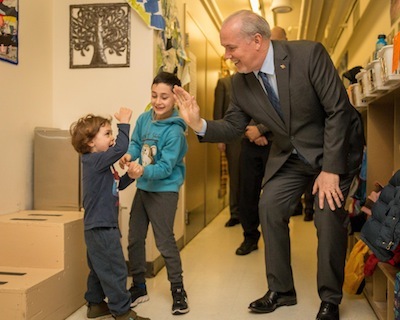 Horgan toured the building, visited the Vancouver Holocaust Education Centre, the sports facilities and spent time with children and parents at the daycare. On April 12, the premier also participated in a Yom Hashoah ceremony at the B.C. Legislature, which included numerous survivors of the Holocaust. In next week’s Independent, there will be more about the Yom Hashoah commemorations that took place in Victoria and Vancouver. While there was no formal agenda for the meeting, after the tour, Horgan met with representatives of agencies that are located in the building. He was introduced and thanked by Alvin Wasserman, vice-president of the JCCGV. 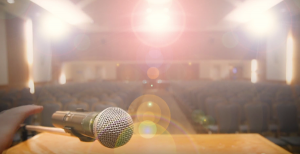 While affordable housing was not on the agenda officially, Goldfarb said he discussed with the premier the opportunity for including such accommodations within the planned redevelopment of the JCCGV site. The new provincial government made a substantial commitment to affordable housing in its first budget, Feb. 27. Nico Slobinsky, director of the Pacific Region for the Centre for Israel and Jewish Affairs, said Horgan was at the centre more to listen than to talk. “He was there to learn a little bit about what the centre does and the opportunity to connect with the community since becoming premier,” said Slobinsky, who helped arrange the visit. “He hasn’t had a chance yet to do that. He did that before but not since becoming premier.